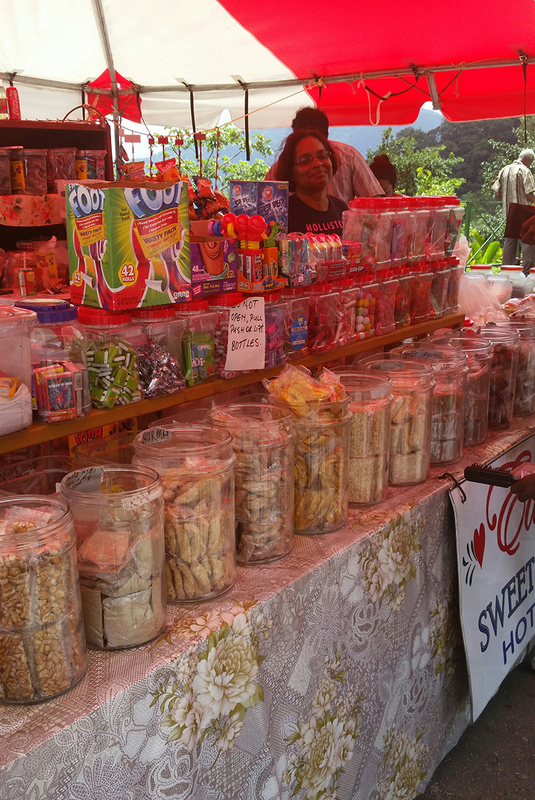 Roadside Vendor selling sweets and chow. 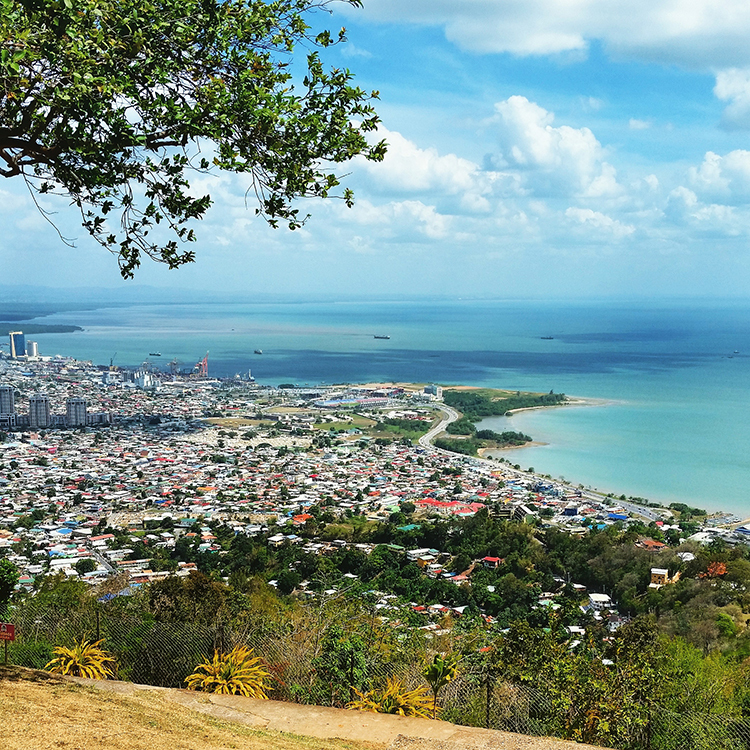 I recently took a week long vacation to the Caribbean Island of Trinidad and Tobago to visit one of my brothers who lives there. This trip about spending time with him and his new family (he’s recently married) and about exploring the glorious food. I had a long list of must-eats as opposed to a must-see list. Before arriving in Trinidad I was sure to send this list to my bother to let him know my intentions-I was there to eat! He assured me that I would be trying it all and more. He is a master in the kitchen and when we weren’t out and about he prepared some of the most delicious food I’ve had in years. Within hours of landing and reuniting with my brother, I was standing on a busy street corner at Ram’s doubles stand devouring 2 hot doubles with sweet sauce and slight pepper. With belly full, he took me on a 5 cent tour. 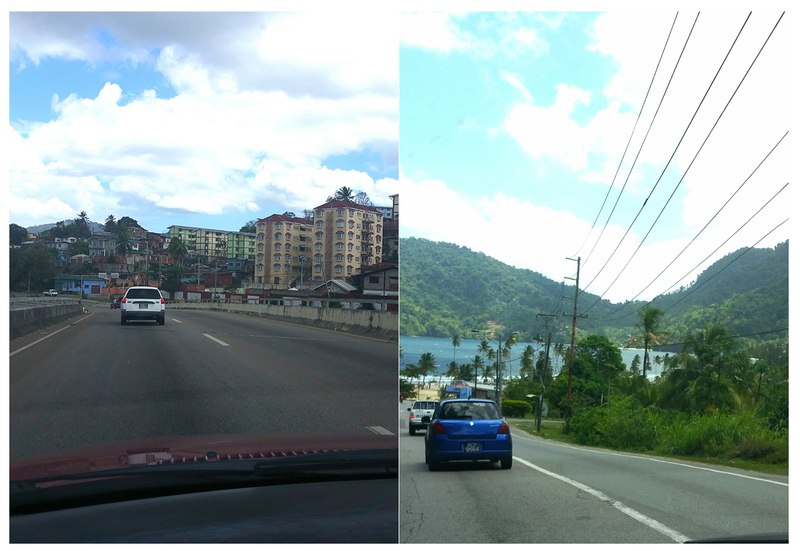 One of the things that I absolutely loved about Trinidad was how many similarities it shares with Guyana. Apart from our food being the most alike in the Caribbean community, some parts of Port of Spain and other outlying areas reminded me of home. I would turn a corner and for that moment I was transported back to Guyana. I felt very much at home. 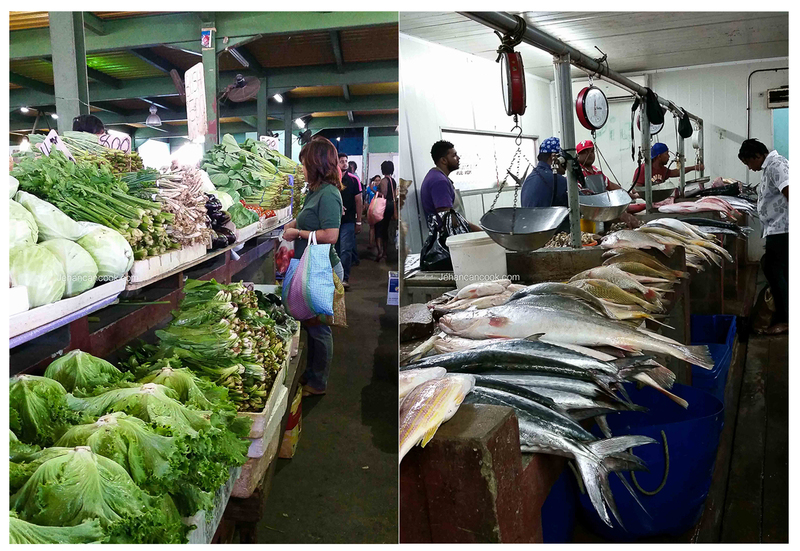 While there I visited Chaguanas Market which was absolutely amazing, it reminded me of Saturday mornings shopping at Stabroek and Bourda Market in Georgetown. I was amazed at how much smaller and less uniform the produce was compared to what we have here back in the States-that’s a good thing. Being in the Caribbean reminded me of a way of life that I had long forgotten about-the slower pace, organized chaotic driving(I spent most of my time on the edge on my seat), simple, uncomplicated meals. I had a lot to eat while there and everything was good! 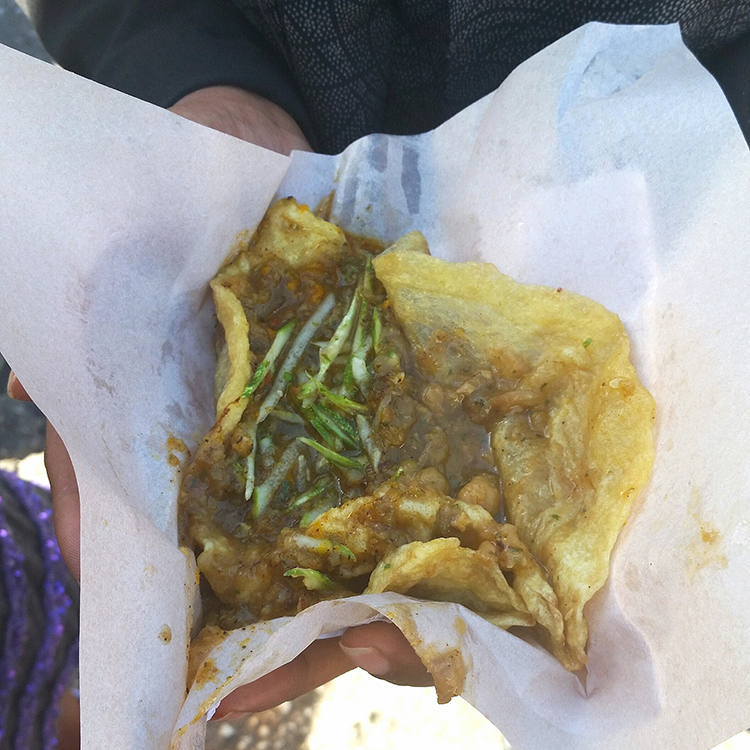 Doubles– This is simply lightly curried channa(chick peas) in between two fried breads called bara. The ones I had in New York are a distant cousin to the original, these are so much better. 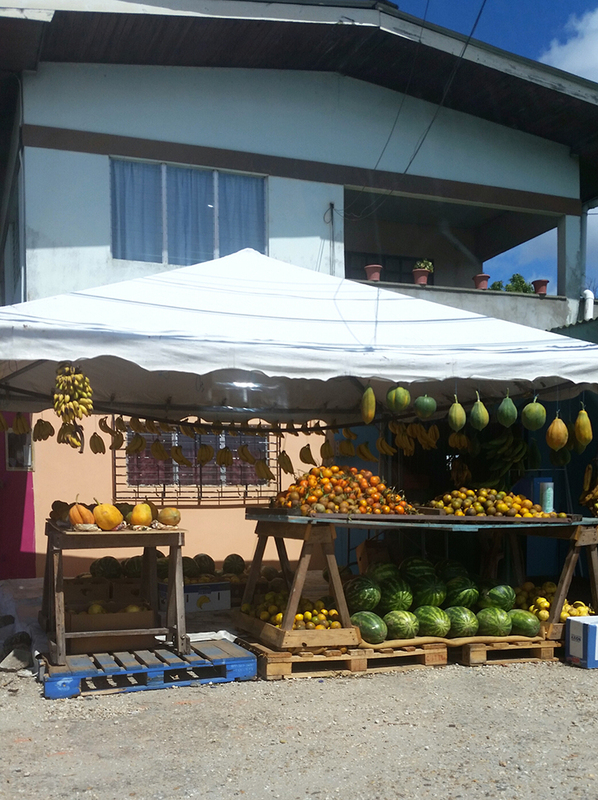 These are easily found on just about every road corner in Trinidad and are dirt cheap. They are less than $1 USD. You can customize your toppings as you like; that’s if you’re not there when it’s super busy and the doubles man is blindly pelting doubles into open napkins. Oh and I loved the fact that you ate as many doubles as you like before paying and no one keeps track. Nope…they trust that you will pay for what you ate and we did. 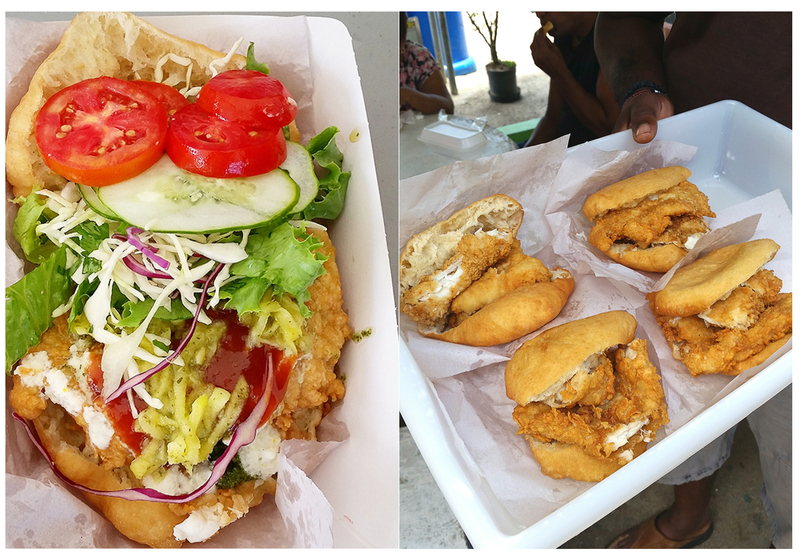 Richards Bake and Shark-this is THE famous Bake and Shark in Trinidad and I was pleasantly surprised that it lived up to the hype. 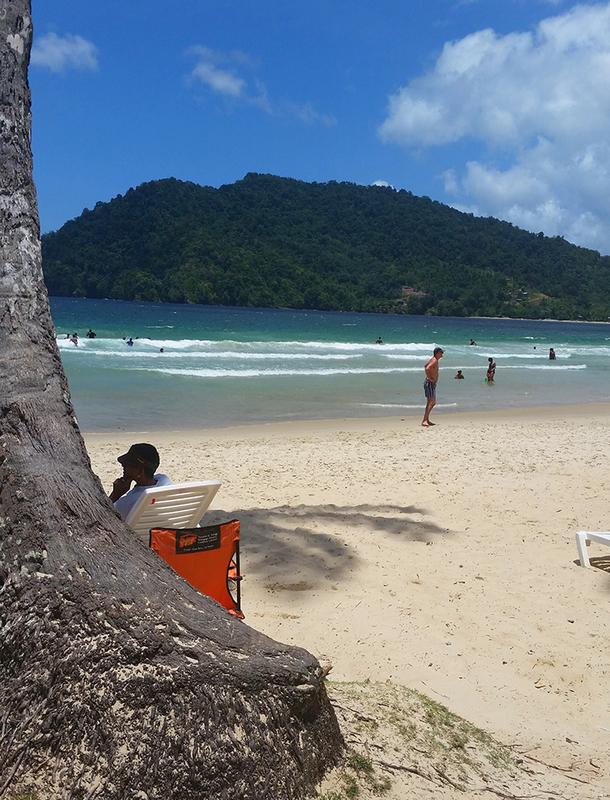 We took a day trip to Maracus Beach and Las Cuevas Beach so we stopped to have a bite. This was a hefty sandwich with a generous serving of fried shark and there was a bar with a variety of fresh vegetables and sauces. What’s better than sitting on the beach in your two piece bikini with a belly full of bake and shark and chow? Yea….that’s why no bikini photos ever have or ever will be posted. Fresh Coconut Water and Jelly-from a vendor, still in the coconut-the best! KFC-a must have if you’re a fan of fried chicken. The flavor is indicative of the regional cuisine, there’s even a spicy chadon beni sauce for dipping or drizzling. Hosein’s Pholourie-Amazing! 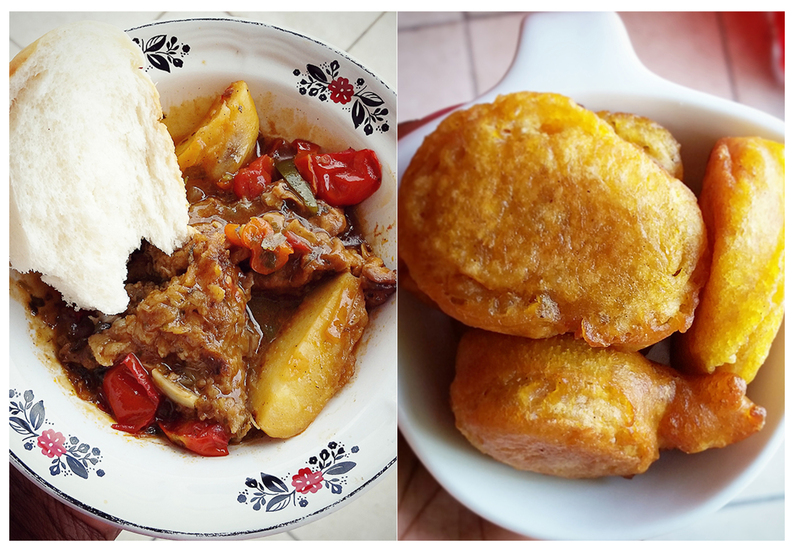 While Trinidad’s version differs slightly from ours, they were delicious. 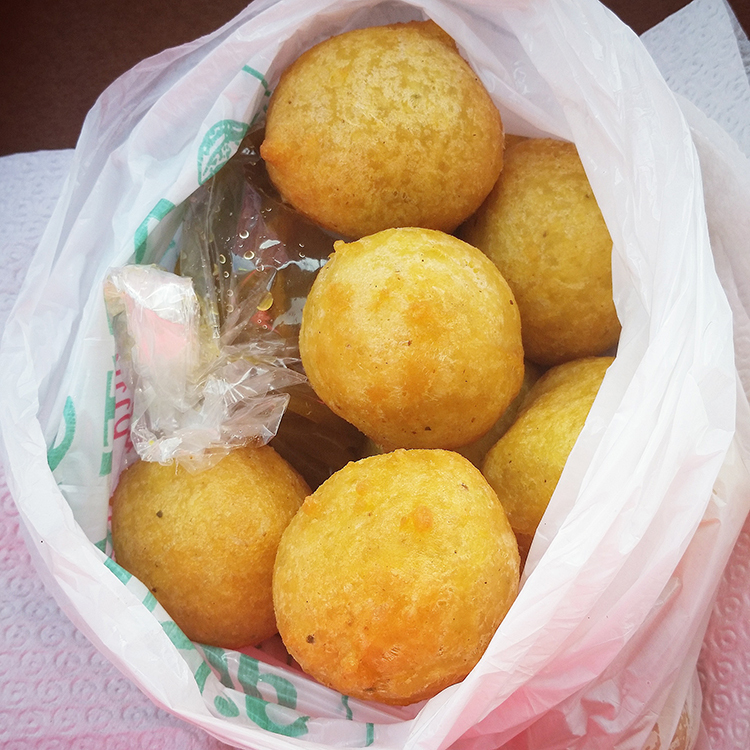 These perfectly round balls made from a split pea batter was served with a sweet mango dipping sauce, pepper is available upon request but please know that pepper sauce in Trinidad is fire blazing hot and not for the faint. Use caution. 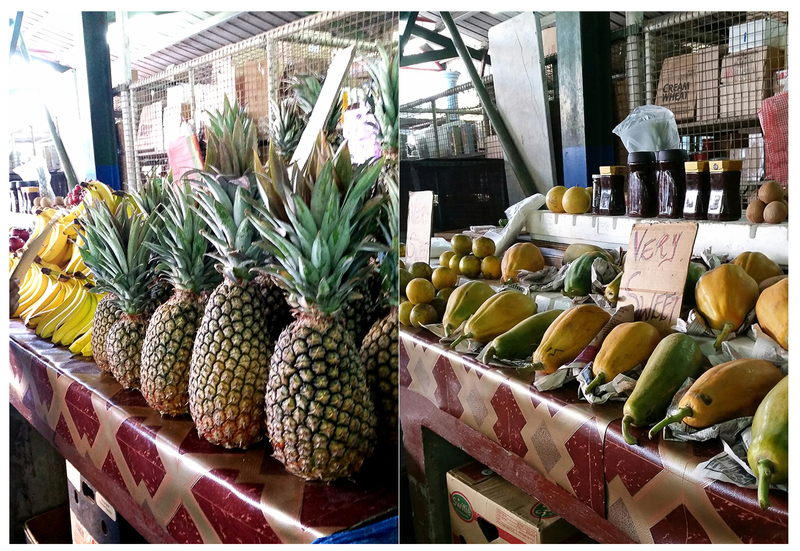 Fresh Local Fruits– Visit the local market or stop at a roadside vendor and take advantage of the amazing variety of fruits here. I was lucky enough to find star apple (caimite), gooseberry, cashew which are virtually impossible to find in the States. Homecooking– If you’re lucky enough to stay by someone local have them cook…all the time. I kid you not, I was suffering from flavor withdrawals when I returned home. My brother cooked up a storm, he made some of the best Bake and pumpkin, roti and fish curry and dulpiti I’ve ever had. 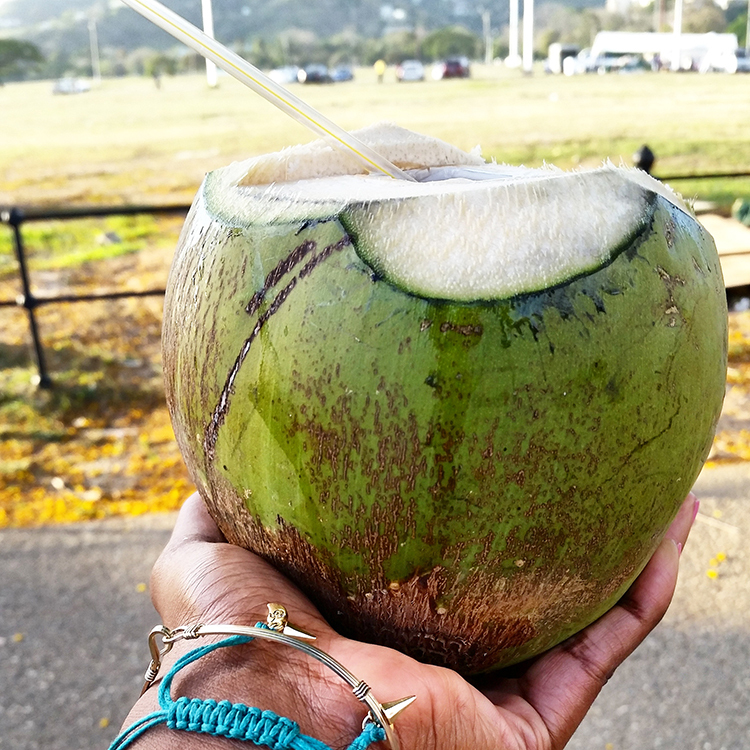 When I wasn’t eating I was busy sightseeing; we visited Chaguaramas, Fort George, San Fernando, the oil refineries, the Savannah where Carnival is held, Maracas and Las Cuevas beaches. I also spent time with one of my friends that I’ve known since high school who had come all the way from New York so that we can lime(hang out). I enjoyed my trip to Trinidad and would recommend it to anyone. I loved the fact that I was able to explore with a local and not have the tourist experience, there’s nothing like it. Love it!!! Great article and it made me miss all the goodies from home. 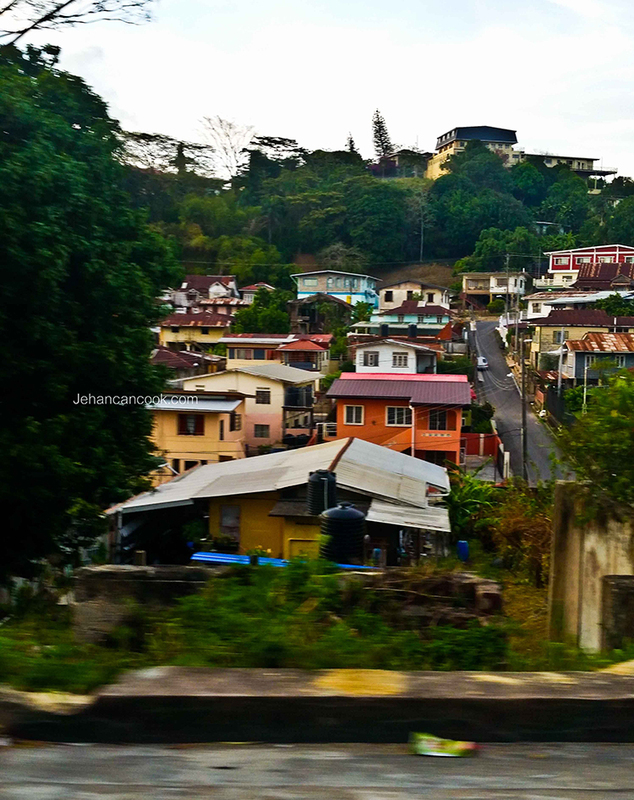 Memories of my birth place……Trinidad. Now I feel like doubles. Sherry, the doubles was the best! Too bad I couldn’t get a good doubles picture. What a lovely story. It depicts your trip to Trinidad very well. It makes me want to take a trip there soon. Thanks for sharing. Learnt a few things here. Never had pumpkin fritters, had to google dulpiti (which didn’t help much, except I know now it’s a type of porridge), and never knew we had gooseberries in Trinidad. I go to the market every week and I’ve never seen them. But I’m going to search now! Nice post. Pity you weren’t here during mango season as fresh ones are better than imports any day in my book. But maybe you got some anyway. Thanks Lee, I was very disappointed that it wEnt mango season. It aS on my list of must taste. Una, you’re welcome! I brought back chocolate, alcohol and a few sweets lol. Space was limited.